Companies need to get better at communicating their social purpose to different audiences including their investors and their shareholders, according to a global thought leader. 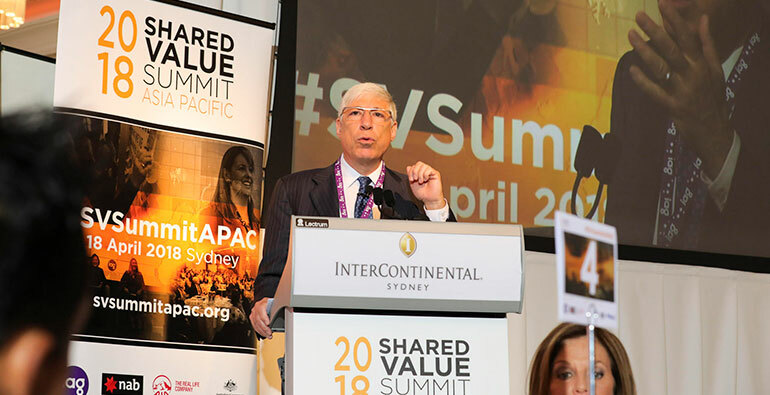 Mark Kramer, the American co-author of Creating Shared Value, co-founder and managing director of FSG, and a director of the Shared Value Project, is in Australia speaking at the 2018 Shared Value Summit Asia Pacific. In the opening keynote on Wednesday, Kramer told the audience there were unique audiences that companies needed to speak to about their social impact, each with different messaging. He told Pro Bono News the default of creating a sustainability report that “gets mailed out to everyone and has everything good that you might be doing somewhere in it”, needed to change. “As someone who gets many of these every year I have to confess I rarely read them and I rarely meet people who have read them, and I think it’s a sort of default idea that we’re just going to tell the world how many good things we do and they’ll think we’re wonderful. And of course it doesn’t really work that way,” Kramer said. He highlighted NGO’s and not for profits, investors, employees and the public as unique target audiences. He said in particular companies were very bad at communicating the value of their social impact to the investor community. “So for the investment community what they need to hear is why the things you are doing that deliver positive social benefit also create value for shareholders, what is the economic impact of those things and how does it relate to the return to shareholders,” Kramer said. He said it was incumbent on companies to “make the case” to investors around why the things they were doing with social purpose improved the bottom line and improve returns. “We don’t see them doing that at all. In fact my colleague George Serafeim has done some interesting research and one of the things he did is analyse the transcripts of 100,000 analyst conference calls. What he found is that the short-termism, the focus on quarterly results and the earnings being met, projections being met to the penny, is actually driven more from the management side than it is from the analysts side,” he said. Looking to the future, Kramer said the investor perspective on shared value needed to be developed more fully. “We believe and have seen evidence that companies that pursue shared value have better stock market performance. But there is still a real skepticism in the investment community whether all this talk about social impact and social benefit really translates to the bottom line and until the investment community is persuaded, I think a lot of CEOs and boards will not be persuaded,” he said. Kramer also addressed the difference between companies that talked about shared value as a pr move or a smokescreen to cover up what might really be going on, versus those who integrated it into their core strategy. According to Kramer, success comes when senior management make the choice to “live the purpose”. “There’s been some interesting research that a colleague from Harvard Business School has published recently examining companies that say they have a purpose,” he said. “Of course a lot of companies say they do. What he did that is so interesting is he really went to middle management and separated companies where the sense of purpose was really just about sort of camaraderie, from those companies that had real clarity about purpose and management saw the senior executives making choices that sometimes had an economic cause but were done for the sake of that purpose. “And those companies, where there with a clear purpose and evidence that management at the most senior level was factoring that into their decision, outperformed on financial metrics and in terms of their stock performance. He said having a purpose was the greatest defence against malfeasance and against a company “going awry”. For companies looking to integrate shared value into their core strategy he suggested the first step was to identify the social issues of most importance to their industry and their competitive position. “Because while every company needs to be a good citizen and every company needs to focus on ESG metrics across all that they do, competitive advantage, which is what shared value is really about, is very much focused on one or a very small number of social issues where your company will benefit disproportionately because of the social impact you create,” Kramer said. “So the first thing is to identify the issues that matter. The second one is to really understand those issues. What are the obstacles? What are the opportunities for social impact? Where can your company play? And part of that is understanding who your partners need to be. Very often you need NGOs and other players to be partners to really achieve a positive social impact. Kramer said corporate Australia was leading the way with adoption of shared value across the Asia Pacific region. “Australia continues to make significant progress towards becoming the shared value nation,” he said. He said he had seen a “tremendous evolution” in the Shared Value Project in the last four years. “When we first came, at the first conference there were maybe 50 or 60 people and all the examples were really of CSR and philanthropy, and we politely extended it to shared value but they weren’t really, and it has evolved tremendously now in terms of the membership of the Shared Value Project, the conference, I understand there are almost 200 people coming, and the examples really are true shared value examples,” he said. “Beyond the conference the Shared Value Project has been doing trainings and workshops on all different topics with different industries and we really see a much more sophisticated conversation take place. Kramer said the initial conversation had centred on the meaning of shared value. “Is it any different than CSR? Can companies really create an economic and competitive advantage through their social impact? What are the examples? Does it work in Australia? I think we are long past that conversation now,” he said. “I think the conversation now is a much more sophisticated one about how we really build this into our strategy and into our operations. Steel, Shared Value Project CEO, said the network of organisations forming in Australia around the shared value movement was a key reason Australia was leading the world. “The summit will not only highlight some of the world’s best examples of shared value, many of which are coming out of Australia, it will also demonstrate the sophisticated network we have established with Australia to support and encourage the business of solving social issues,” Steel said. The 2018 Shared Value Summit Asia Pacific, which was held in Sydney for the first time, brought together 180 corporate, government and community leaders from across Asia Pacific, with speakers including IAG managing director and CEO Peter Harmer, NAB chairman Ken Henry AC and IAG chairman Elizabeth Bryan AM.